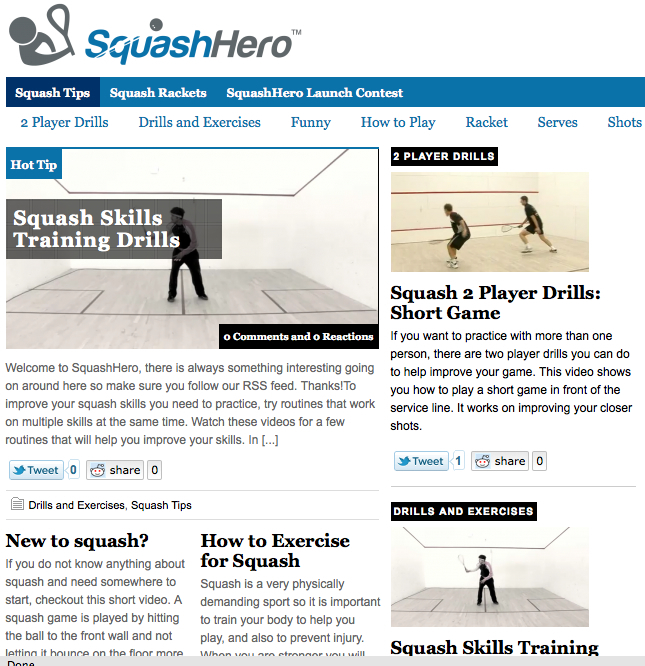 Squash Hero is a new commercial site whose primary business is to sell racquets – BUT – they also seem to have an interesting Squash Tips section. I stumbled across a YouTube video first – which led me to the site. Coincidentally I received an e-mail the next day [promising me a free t-shirt if I blogged on the new site (full disclosure – I like new t-shirts – although it is tough to get one that fits my muscular, slim frame properly:). 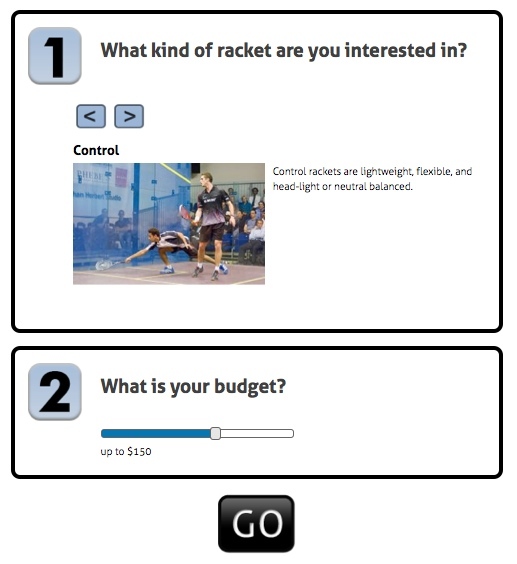 Their Tip Section is a compilation of tips and videos from other squash sources – but it is nice to have them listed in an orderly fashion (although the list could be improved with a “tactical framework” categorization. On the racquets side of their site they have an innovative “racquet selector” which at the very least is a competent listing of available racquets from mainstream manufacturers. (although I think full functionality will come with the “official” opening of the site in the near future). So a promising new site for both choosing a racquet and coaching tips – if they are able to sustain their current momentum! Why I Purchased a Ping Pong Robot but Won’t Buy a Squash Ball Machine! I’ll preface my post by saying that I did in fact own a squash ball machine – the first one that came out (1989??). I co-purchased it when I was the “squash director” at the now defunct Rockland Sport (actually there to train/mentor their squash pro Denis Favreau who was converting from tennis – little known fact – Jonathon Power got his start here with great junior coach Robby Cannot Recall his name now – will later…) with my buddy, Yvon Provencal, recently named Canadian National Squash Coach. I don’t recall ever actually using it (Yvon kept it at his club!) since I had already been indoctrinated into a “tactics first” approach through my exposure to Tennis Canada’s “Methode des actions” (read “Tactics First”). Why did I just purchase a Newgy Robo-Pong when I will not buy a squash ball machine? 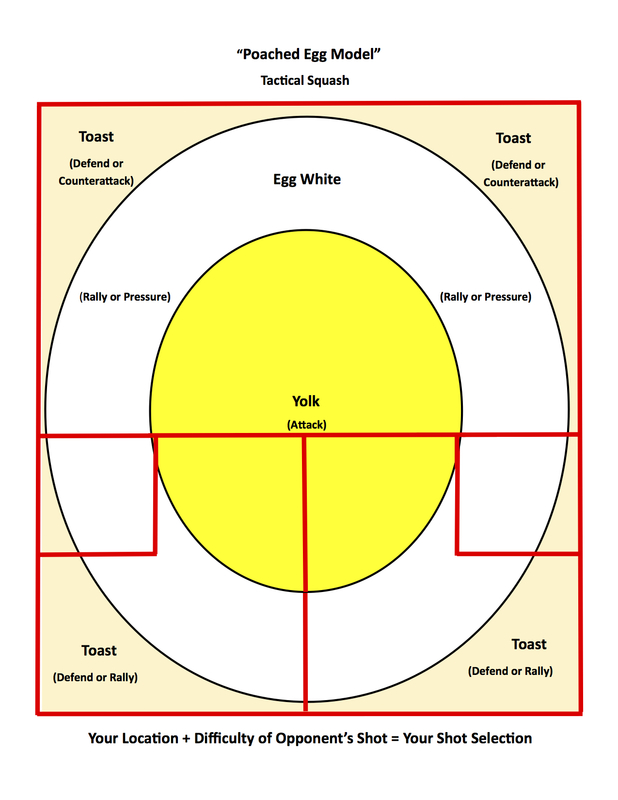 The Squash court is ideal for solo practice – you can simulate a wide variety of shots – not possible with many ping pong tables – and only possible in a limited way in those that can convert one half to a backboard. Be wary of potential bad technical (not observing the shot cycle) habits developing with squash ball machines. Be sure to give your player a tactical context or at least a basic tactical explanation for the shots they practice with a ball machine. 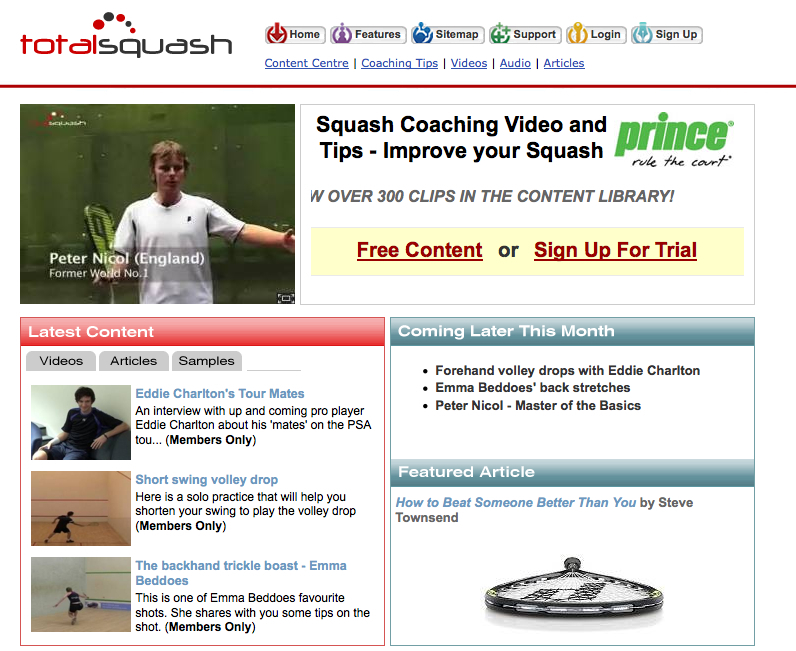 iPhone 3Gs plus Twitter for Squash Video! The problem with having a great camcorder and computer video editing software is that it takes time to get the video ready for playback to athletes – a real problem if you are coaching multiple (usually 10 at Smith College) squash players, playing im multiple matches (total of 50 matches this upcoming weekend at the Wesleyan Round Robin in Middletown, CT. In this video I tell how I will how I will use my iPhone 3Gs and FREE Twitter apps like Twitterific or TwitVid to allow my team (10 players) to watch results of their matches at the 2009 Wesleyan round robin (so 50 video clips!). They can watch their own clip individually, before or after a match if they bring their laptop, as Wesleyan has wireless (as we do at Smith) right by their courts – or if they have an iPhone – they can watch it anytime using the ATT 3G network. Shoot (keep clips under 60 sec. for quick upload) – you can obviously record verbal feedback at same time. 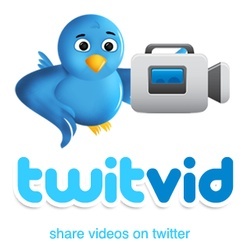 Open your FREE Twitter app – I use Twitterific, Echofon or Twitvid. Write your short “Tweet”, eg. player name, game score – and hit “send”. If my player is signed up to follow “smithsquash” on Twitter, they will receive a “Tweet” with a link to the video (as will you if you sign up to follow “smithsquash” on Twitter). What I like about Twitvid is that I can go to their site and review all of the days match videos with my team later – they will all be in one spot identified by players name – so I just scroll down to the clip I want. Here is a sample clip on the TwitVid site from a scrimmage against Mount Holyoke earlier this week.